Afghanistan will play their debut Test match against India at the M Chinnaswamy Stadium in Bengaluru from June 14 to 18. As India is at # 1 position in ICC Test ranking. Afghanistan, who will become the 12th test playing nation on Thursday, have unlimited potential -and Afghan captain Stanikzai is confident that the recent drubbing of Bangladesh has lifted the morale of the side, despite the win coming in the shortest format of the game. "We are ready for the Test match against India - our morale is high," the Captain said after his teams defeted Bangladesh by one run in the third and final T20I here on Thursday. "Last couple of years we have performed very well. the team wants to achieve it for Afghanistan. You see the batsmen, bowlers are all in good form." Not a regular game of cricket was played in the country 15 or even 10 years ago, it was simply played in refugee camps in Pakistan, yet this week Afghan cricket team will take on India. Debut and only test Afghanistan vs India will be played at M Chinnaswamy Stadium in Bengaluru. If we look past record about pitch it will be batting and spin track and it will favor the spin Blowers. 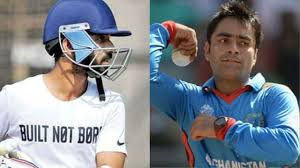 At this spinning track Rashid khan the man behind Afghanistan 3-0 win against Bangladesh will be very effective and frontman for Afghanistan against India. India has strong batting line-up which can destroy any blowing line up of the world. Who will Win? India vs Afghanistan Test Match Predictions. Afghanistan has a young and energetic team. But if we look India past record they play very well at their home ground. It will be a good match but there are great chances India will win the only test against Afghanistan.india has a strong batting line up as well as they have good spinners who can destroy Afghan batting line up. Live Cricket, Cricket Score, Live Cricket Score. You can enjoy Live Cricket, Cricket Score, Live Cricket Score and analysis on cricbooth.com. You can follow our twitter and FB page for more updates.